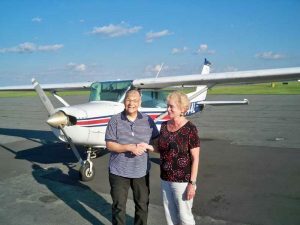 Sue Brownfield with Designated Pilot Examiner Zenda Liess. Sue Brownfield achieved her goal of becoming a Private Pilot on September 19, 2018 at the Burlington, NC airport with DPE Zenda Liess. Sue resides in Mt. Airey, NC overlooking the Blue Ridge Parkway.